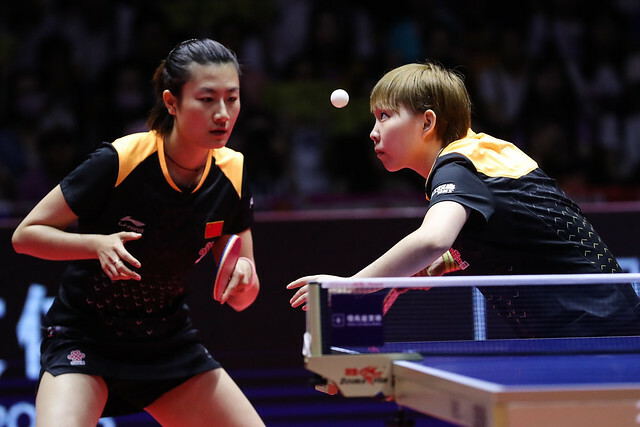 Gold medallist at the first ever Youth Olympic Games, China’s Gu Yuting upset the order of merit in the opening round of the Women’s Singles event at the Seamaster 2018 ITTF World Tour Platinum, Kaisa China Open, by beating the player who has high aspirations of following in her footsteps later this year in Buenos Aires. On the afternoon of Thursday 31st May, Gu Yuting, who had been required to compete in the two day qualification tournament, overcame Japan’s Miu Hirano, the no.5 seed (12-10, 6-11, 11-7, 11-5, 12-14, 11-2). An upset; I would suggest it was quite reverse. Gu Yuting confronted Miu Hirano on four occasions last year on the Seamaster 2017 ITTF World Tour. They met in Qatar, Australia, Austria and at the Grand Finals in Kazakhstan; Gu Yuting emerged successful on all three occasions. Defeat for Miu Hirano for colleague Saki Shibata, there was the reverse scenario as the early matches in the opening round of the Women’s Singles event were completed. The 20 year old beat Korea Republic’s Suh Hyowon, the no.10 seed (11-7, 11-9, 11-8, 11-9) to reserve her place in round two. Mixed fortunes for Japan, it was the same for Korea Republic; Jeon Jihee upset the order of merit. Also a qualifier, she accounted for Chinese Taipei’s Cheng I-Ching (14-12, 7-11, 6-11, 11-9, 11-9, 8-11, 17-15). Farewell to three seeds as the top half of the draw in the opening round of the Women’s Singles event progressed, for the remaining principal names it was success; Chinese star names especially to the fore. Zhu Yuling, the top seed, beat Japan’s Minami Ando (11-4, 11-6, 6-11, 11-8, 11-7); Ding Ning, the no.9 seed, accounted for colleague Che Xiaoxi (11-9, 12-10, 14-16, 11-7, 11-9). Likewise, Singapore’s Feng Tianwei, the no.3 seed, accounted for Korea’s Ji Eunchae (11-3, 11-2, 11-7, 11-7); Hong Kong’s Doo Hoi Kem, the no.15 seed, ended the hopes of Japan’s Miyu Kato (12-10, 12-10, 12-14, 11-7, 16-14). The matches in the lower half of the first round Women’s Singles draw plus the second round in entirety will be played on Friday 1st June.